It's hard to top Mr. Hentoff's passionate defense of the band, appeared for the first time on JazzTimes, when he said "I wish those male musicians and the old-time critics who kept insisting that women don’t have the chops to be jazz musicians were still here to confess how prejudice had closed their ears." However, even today, if one wants to know more about the history of Diva by, for instance, going to Wikipedia or AllMusic Guide, the search would be hugely disappointing. Aside from the band's official website, no reliable source of information exists about Diva and only very few articles have been written about them worthy of their talents and their contribution to jazz. Conclusion? Still a long way to freedom from gender stereotypes and the sexist attitude in, practically, everything! 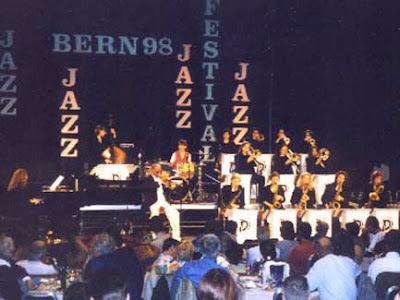 In order to celebrate Diva's 20 anniversary, Take the "A" Train presents their 1998 Bern Jazz Festival concert almost in its entirety. I say almost because judging from the picture I've used above (taken from Diva's website), Clark Terry has joined the band onstage at some point (maybe encore? ), a part that doesn't exist in my video of the concert. Previously two videos of the concert were published online (the first two clips here) which have lower quality comparing to my old VHS tape. Nevertheless, I'm grateful to the uploader, as my tape is missing exactly those two bits! Order of solos: Nicki Parrott, Karolina Strassmayer, vocal trio (Jami Dauber, Clare Daly, Lolly Bienenfeld). Order of solos: Cynthia Mullis, Barbara Laronga, Jill McCarron, Sherrie Maricle. Order of solos: McCarron, Nicki Parrott. Order of solos: Laura Dreyer, Jill McCarron, Tanya Darby, Mullis, Maricle. Order of solos: Jami Dauber, Jenny Hill, Dauber, Maricle.